T.P. or not T.P.– that is the question. Long before you were reading about Cameron Diaz driving a Prius or an ex-Spice girl creating a clothing line made of recycled Big Mac containers, my mom was already ahead of the trendy times and acting as a leader of conservation. She could be the spokesperson for the Green movement. Except that her reasons for reducing, reusing and recycling are slightly different than why most people try to reduce their carbon footprint. Not too concerned with preserving the environment for future generations to enjoy, what my mom was really trying to do was maximize limited resources. For example, when it came to toilet paper, we were told that one square would suffice per bathroom visit. 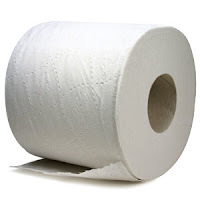 Two squares of toilet paper would be allowed if we were doing number two (appropriately enough). This limit placed on toilet paper created an illusion in our minds that toilet paper was highly valuable, a commodity not to be used in excess or without need. So in third grade, when I found myself in a bathroom stall at the roller skating rink across the street, after I knocked over a standing roll of t.p. into the toilet, panic gripped me. What to do? Leave it in the toilet where it would get sucked down and get stuck in the plumbing? Or risk contracting horrible diseases on the order of HIV to salvage such precious paper? I stuck my arm in and pulled it out and placed it back on top of the toilet paper dispenser. Maybe this highly-held importance of toilet paper was too much. Perhaps nothing should have a kid feel so compelled as to throw an arm in a public restroom in order to save a drowned roll, regardless of the ply-count or the absorbent quilting. But there can also be cases of using too much toilet paper and not enough reverence for the soft white squares. Such as my roommate who goes through entire rolls in a day, two days max. The trash can can oft be found spilling over with crumpled sheets of tissue, balls of paper. Because we have better plumbing than most third world countries, I am pretty sure he is not placing his soiled paper in the trash can. Actually, I am pretty sure the only way one can use that much toilet paper in such a short amount of time, is that he does away with the rough terry cotton towels common folk (such as myself) use to dry themselves after showering and instead uses sheets upon sheets of t.p. to dry himself. Or he is practicing being a mummy for a stand-up routine he performs nightly and must get the bandaging just right. Given that he works full time and none of his jobs (to my knowledge) involve putting on a show or mummy-acting, I can say with confidence I believe the extravagant use of t.p. is due to his substitution of shower towels for soft Charmin, 2-ply paper products.